Another week has flown by (is it REALLY less than 3 months until Christmas?) and it's Friday again! And that means it's time for us to get our whoop whoop on - so let's get started!! 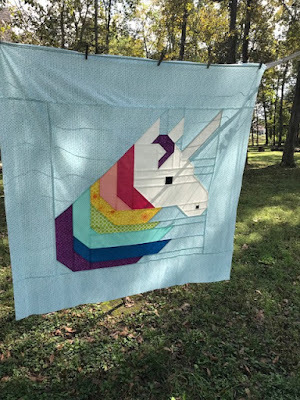 When I spotted this pattern on Lorna's website, I knew I had to have it for a certain little girl who is a unicorn (when she's not a mermaid)! I decided that this would be Emmy's annual quilt this year. I knew it would be perfect, especially after I asked her what her favorite color was, and she answered, "Rainbow!" On Tuesday afternoon, I started cutting out the quilt. There are lots and lots of pieces, but the pattern is very well written and it was easy to keep track of what I was cutting. A little later I started putting the pieces together. I was amazed at how quickly these sections assembled! And now you can see her nose! A big diagonal seam across the corner, and she's finished!! Ok, well maybe not finished at this point - I did add borders to take it up to 60" square. And when the sun decided to come out, I ran outside to get a shot in the beautiful light! Share! We want to dance right along with you. Lovely unicorn, she will love it! Does she know what her quilt will be? She is going to be so excited when she receives this. Way to go, you are ahead on the Christmas quilts! All of Lorna's patterns are wonderful and so easy to follow. If I ever have grandchildren, I hope I remember to do this for them. What a great idea. I'm sure she will love that unicorn! 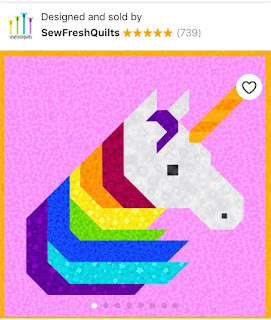 I saw a fleece unicorn pillow on Pinterest earlier this week. Super easy to make. It would go great with the quilt. She's going to love it! Great job! What an adorable quilt! Emmy is going to LOVE it. That quilt is just adorable. I hope to have to make that someday for a unicorn loving child. The unicorn looks a lot more complicated than you make it sound. I'm sure she'll love it! I love this pattern! I've been debating between this one and Lisa the Unicorn for my nieces. Oh yes, whoop whoop for you! Aren’t Lorna’s patterns amazing? So carefully done. Funny how those little unicorn/mermaids are everywhere. Little Miss Emmy will love this!! Wow, that was super fast. 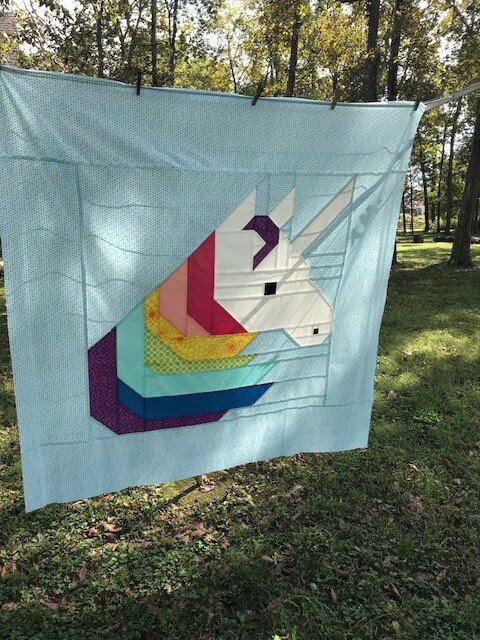 I bet it felt good after all the piecing needed for Lilianna's quilt.